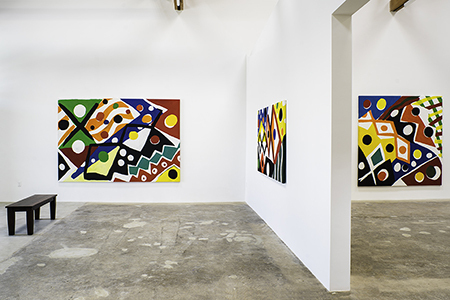 Like many of the artists who were associated with the Pattern and Decoration movement of the 1970s, MacConnel has long employed a heady mix of what used to be called "high art” — the Avenida Revolucion works are a deliberate nod to Henri Matisse's paper cut-outs from the 1940s and ‘50s — alongside what used to be called "low art" or craft — MacConnel's art has often referred to textile arts and this body of work, in particular, alludes to the Mexican folk art known as papel picado. MacConnel's engagement with "low art" in "Avenida Revolucion" is articulated by his use of flocking, small fiber particles that are spread across the surfaces of some paintings to give them a velvety surface akin to tacky 1980s wallpaper. In 1939, “The Wizard of Oz" contrasted black and white footage with passages in the still unusual Technicolor process to highlight the difference between the stormy darkness of daily life (embodied in the tornado) and the cinematic delight of rainbow color. MacConnel's "Avenida Revolucion” at Rosamund Felsen Gallery is a Technicolor spectacle. His concurrent exhibition at Quint Gallery, entitled "Black & White," is precisely that: a series of his large paintings reduced to black painting on a white ground. Pictorially minimal, they are nonetheless as vibrant and animated as their colored siblings. MacConnel draws inspiration from a multitude of sources. We see echoes of Cubism and Fauvism in these works. We also see reflections of Native American and tribal African art, two traditions that were mined by the early 20th century European avant-garde. But whereas Pablo Picasso, for example, incorporated the structural distortions of African masks to tell (for example) a story about prostitutes in a Barcelona brothel, MacConnel does not use his painting to deliver a narrative. Instead, he allows lived experience to move through him, coalesce into form, and emerge as explosive abstractions. His inspiration is not dance masks but the sub-Saharan textiles characterized by zigzagging triangles, marching diamonds and dynamic stripes. In both bodies of work, but especially in the "Avenida Revolucion," we also see parallels with the indigenous weavings of Mexico. Still produced in and around the Aztec capital we know today as Mexico City, as well as in the state of Oaxaca and throughout the Yucatan, native textiles from Mexico are similarly exuberant abstractions of brilliant color. True to his Pattern and Decoration roots, Kim MacConnel has translated these many "low art" sources into extraordinary "high" art: large abstract paintings on wood panels that invite viewers into celebratory environments of brilliant color.